Autograph album that belonged to Aravesta Hawes Pillsbury, "Vessie", of Franklin, Massachusetts, a student at Dean Academy there. Dean Academy, founded in 1865, is now Dean College. Vessie was a native of Union, Maine. Vessie added notes to several of the inscriptions, indicating marriages or deaths. Inscriptions are dated mostly in the 1870s, with additions by Vessie up to the 1942. Vessie was given the album by her younger half-brother John C. Pillsbury. 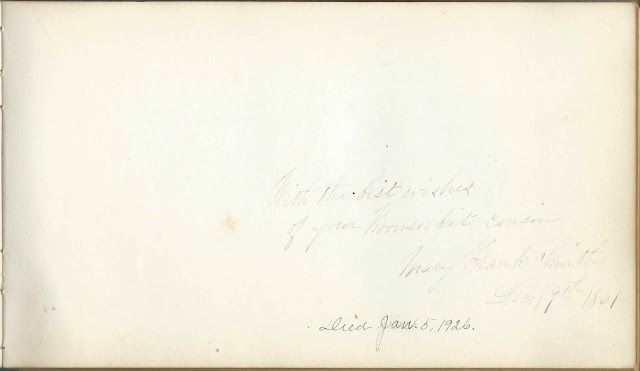 "Vessie H. Pillsbury, Franklin, Mass, A present from Brother Johnnie." The earliest inscription, by Vessie's cousin Mary Frank Smith of Woonsocket, Rhode Island, appears to be dated 1861, but that would be a decade earlier than most of the inscriptions. I wonder if the inscriber meant 1871. As you can see, Vessie noted Mary's death on January 5, 1926. The album measures approximately 7-3/4" by 4-3/4" and contains the sentiments of over 100 of Vessie's relatives, friends, schoolmates and teachers. An alphabetical list of the inscribers, together with any personal information they offered, appears at the end of this post. Aravesta Hawes Pillsbury, "Vessie", was born at Union, Maine, I think on December 13, 1859, the daughter of David Green Pillsbury and Aravesta Matilda (Hawes) Pillsbury. Sadly, Vessie's mother died the following day. Vessie's father later married Hannah Walcott, mother of Vessie's half brother John C. Pillsbury. The H. W. Pillsbury who inscribed a page at Union, Maine, was presumably Hannah (Walcott) Pillsbury, Vessie's stepmother. 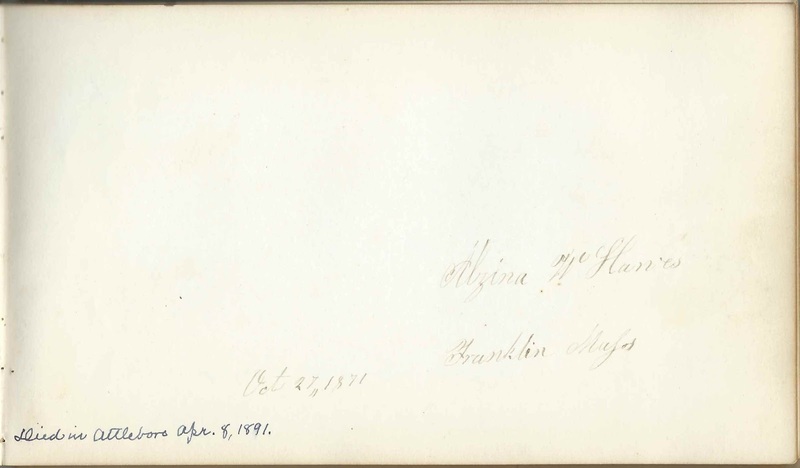 Vessie's maternal grandmother, Alzina (Walcott) Hawes of Franklin, Massachusetts, a native of Maine, inscribed a page in the album. Vessie added a note that her grandmother died at Attleboro, Massachusetts, on April 8, 1891. 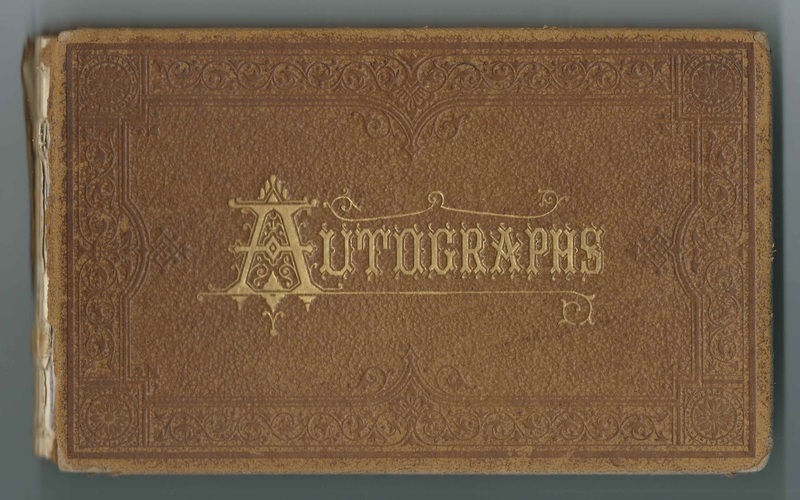 Many other relatives in Maine, Massachusetts and Rhode Island inscribed pages in the album, including, presumably, some who did not express their kinship. On October 7, 1884 at Franklin, Massachusetts, Vessie married Arthur Henry Paul, son of inventor Seth D. Paul and Elizabeth (West) Paul. Arthur was born December 9, 1856 at Waltham, Massachusetts. At the time of their marriage, Arthur was working as a grocer at Woonsocket, Rhode, Island, and Vessie was teaching at Franklin, Massachusetts. The A.P. who inscribed a page was presumably Arthur Henry Paul, as Vessie's notation of his death date, corresponds to Arthur's death date of August 19, 1921. By the time Arthur died, according to his death certificate, the couple had been living at Saco, Maine, for about three weeks. I didn't find a record of children for Vessie and Arthur. Vessie died in 1946. She and Arthur are buried in the Woodlawn Cemetery at Attleboro, Massachusetts. If you have corrections to the information above, or information on any of the inscribers listed below, please leave a comment or contact me directly. Lizzie T. Almy of New Bedford, Massachusetts; inscribed at Dean Academy, Franklin, Massachusetts, on June 10, 1875. Elizabeth Tibbetts Almy. Louie N. Baldwin of Bangor, Maine; inscribed on August 14, 1874. "Remember our week's "Camping out" on Harbor Island"
Florence M. Bartlett of Somerville, Massachusetts; inscribed at Dean Academy. Lizzie C. Becket of Chelsea, Massachusetts; inscribed on May 13, 1876. Vessie's later note: "Elizabeth B. Lamb, Died Jan. 27 - 1920 Attleboro, Mass." Mary H. Belden of Meriden, Connecticut; inscribed at Dean Academy on May 12, 1875. Mary Higley Belden. Rebecca C. Bryant of Woonsocket, Rhode Island; inscribed on July 25, 1873. Her sister Fannie C. Bryant inscribed the right facing page. S. Fannie Bryant of Woonsocket, Rhode Island; inscribed on July 28, 1873. Her sister Rebecca C. Bryant inscribed the left facing page. Ella A. Capen of Willow Creek, Minnesota; inscribed at Dean Academy on January 25, 1875. Ella Almira Capen. A. St. John Chambre, inscribed at Franklin, Massachusetts, on September 16, 1875. Vessie's pastor. Rev. Albert St. John Chambr. Shared the page with his wife Harriet (Lancaster) Chambre. H. L. Chambre; Rev. Chambre's wife Harriet (Lancaster) Chambre. Shared the page with her husband Rev. Albert St. John Chambre. E. S. Fossett of Portland, Maine; inscribed on August 26, 1874. 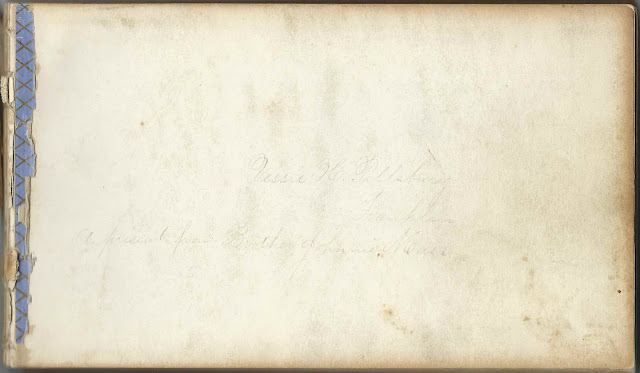 Edgar S. Fossett, whose wife Phoebe R. (Hawes) Fossett inscribed the right facing page. P. R. Fossett of Portland, Maine; inscribed on August 26, 1874. 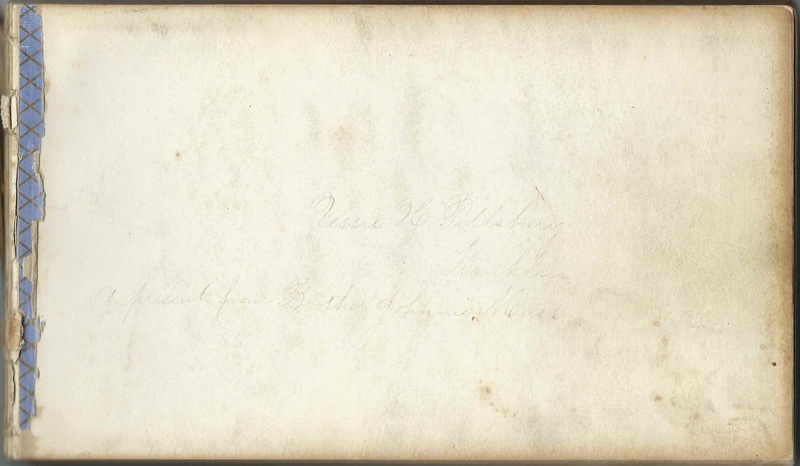 She was Phoebe R. (Hawes) Fossett, wife of Edgar S. Fossett, who inscribed the left facing page. Phoebe was Vessie's cousin. W. H. Gould of Attleboro, Massachusetts; inscribed on October 13, 1877. William Henry Gould, who married Vessie's maternal aunt Abigail Simmons Hawes. Vessie's later note: "Died in Marblehead Apr 22, 1942. Buried in Attleboro Apr. 24." Abbie S. Hawes of Franklin, Massachusetts; inscribed on October 28, 1871. Vessie's later note: Abbie S. H. Gould died Feb. 21, 1942, Attleboro, Mass.". Abbie was Abigail Simmons (Hawes) Gould, who was the sister of Vessie's mother Aravesta Matilda (Hawes) Pillsbury. Abbie married William H. Gould in 1878. Roxana Hawes of Union, Maine; inscribed on October 7, 1876. Roxana (Robbins) Hawes, wife of William G. Hawes, who inscribed the right facing page. W. G. Hawes of Union, Maine; inscribed on October 7, 1876. William G. Hawes, husband of Roxana (Robbins) Hawes, who inscribed the left facing page. Sheldon T. Kinnecom of Providence, Rhode Island; inscribed at Dean Academy, '76. Sheldon Thornton Kinnecom. The word "Chums" straddles this page and the facing page inscribed by George S. Sheldon of Sheldonville, Massachusetts. J. D. Marchant of Providence, Rhode Island; inscribed on September 1, 1872. He was Josiah Davis Marchant, whose wife Eliza Matilda (Hawes) Marchant inscribed the right facing page. A.P. Presumably inscribed by Vessie's husband Arthur Henry Paul. 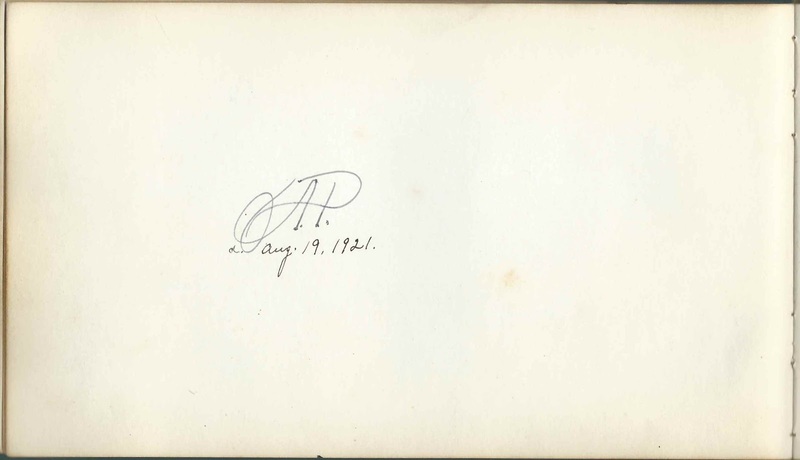 Vessie's note: "d. Aug. 19, 1921", which is the date that Arthur Henry Paul died at Saco, Maine. John C. Pillsbury of Union, Maine; presented the album to his older half-sister Aravesta Hawes Pillsbury, "Vessie"
Vessie H. Pillsbury of Franklin, Massachusetts; presented the album by her younger half-brother John Pillsbury. Vessie was Aravesta Hawes Pillsbury, born at Union, Maine, in 1860. Susan Ray; inscribed at Franklin, Massachusetts; on November 14, 1876. Middle initial might be K or ? John Richards of Waldoboro, Maine; inscribed on August 17, 1874. His wife Sarah Frances (Storer) Richards inscribed the left facing page. 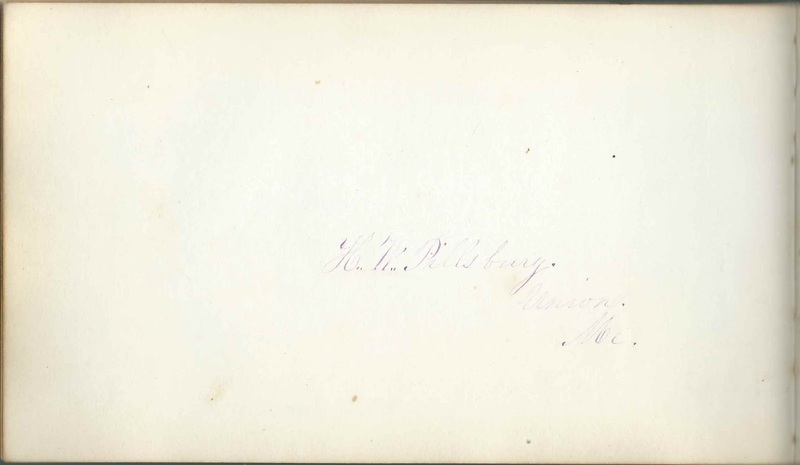 Mrs. S. F. Richards of Waldoboro, Maine; inscribed in August 1874. She was Sarah Frances (Storer) Richards, whose husband John Richards inscribed the right facing page. Frank E. Rockwood; inscribed on May 4, 1872. Class of 1874 at Brown University. He wrote the symbols for Delta Kappa Epsilon. Lena C. Start of Melrose, Massachusetts; inscribed on June 14, 1875. Philena C. (Stevens) Start, "Lena", wife of William A. Start, with whom she shared the page. Hattie B. Stetson of Gloucester, Massachusetts; inscribed on June 3, 1877. Harriet B. Stetson, who was the Preceptress and teacher of French and German at Dean Academy in 1876. Idella Marion Waite of Franklin, Massachusetts; inscribed on June 17, 1871. Idella Marion Waite, "Della"